Operation IceBridge is National Aeronautics and Space Administration’s (NASA) longest-running aerial survey of polar ice to assess changes in the ice height of glaciers. On October 10, 2018, NASA began a 5-week-long IceBridge deployment. The flight originated from Punta Arenas, Chile, and is scheduled to conclude on Nov. 18. As recounted on NASA.gov, on Oct. 16, 2018, the IceBridge aerial survey flew over the northern Antarctic Peninsula. IceBridge senior support scientist Jeremy Harbeck spotted two sharp-angled rectangular icebergs floating among sea ice just off of the Larsen C ice shelf. 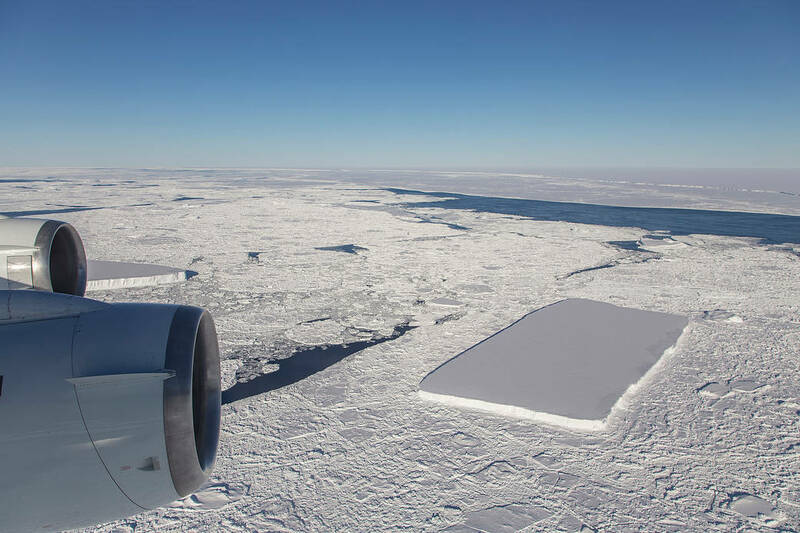 The rectangular icebergs appeared to be freshly carved from Larsen C, which in July 2017 released the massive A68 iceberg, a chunk of ice about the size of the state of Delaware. 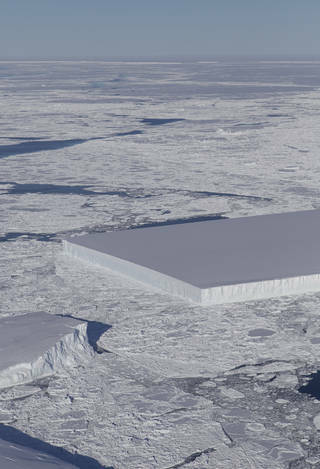 Here’s a closer-up image of the larger rectangular iceberg, showing the iceberg’s sharp angles and precision-cut edges. How do natural icebergs get to be rectangular in shape, with sharp angles? This entry was posted in NASA, Science & technology and tagged A68 iceberg, Antarctica, Jeremy Harbeck, Larson C ice shelf, Operation IceBridge. Bookmark the permalink. There’s no way folks. Dr. E is right again! I was surprised they released the photo, as it’s bound to raise suspicions due to its extreme singular appearance. Someone has been up there doing some carving, maybe to speed up some surface oil exploration? Yes, nature makes no right angles in anything. An ex naval officer tells what he saw in Antarctica when he was stationed there. Let’s ask Al Gore if he knows about it. Hey Al, have you been down under? Hahahaaaaa!!! I hate to be the odd man out here, but rectangular ice formations are possible, although rare: I’ve seen them on frozen ponds—although I never saw more than one right-angled corner on one. According to the FDA, ice is a food. Therefore, it follows, that Antarctica is the world’s largest contiguous food source! The only way you would have something like this is if it were formed in a mold. Otherwise, someone would have to cut those edges. That’s pretty unlikely unless they have something I don’t know about. Directed Energy Weapon. Space LASER. See recent fires in Northern California and Greece. The ice is not receding, it is advancing, but since our beloved overlords need our money, they are simulating global warming to remove dollars from your pockets by breaking up the ice with LASERs and selling the idea that it is melting. I consider it very abnormal for ‘mother nature’ to produce such a phenomenon. If it is in fact ‘man-made’ it is of little consequence. If it is ‘alien’ made….what are we to do about it?? Such things pique my interest while proving my ignorance of what may be. Speculation is free but all too often…futile. Does it matter what shape it is in? Japan will come along and tow it so it can bottle it as “rectangular iceberg water.” And, people will buy it as a health food for $20 or more a 32 oz (or less….) bottle. Done Deal: cure cancer and ADHD and baldness and all the rest. 🙂 ROFLMAO.